These Bacon Pickle Fries make a perfect party appetizer, snack, or side dish to a meal. Easy to make and fun to eat! This recipe is low carb and a Trim Healthy Mama S Fuel. My whole family loves pickles . . . and bacon. So why not combine the two for a tasty snack? Seriously, these are so good and so easy to make. Truly, this can hardly be called a “recipe.” But I thought some of you may be looking for appetizer ideas for the Holidays. To see just how EASY this recipe is, watch the video below. That is why it is a good idea to take your own treats. Offer to bring a dish to help out, then make something you can eat to take with you. That way, you can be sure to have something to eat, and you don’t feel like you are missing out. 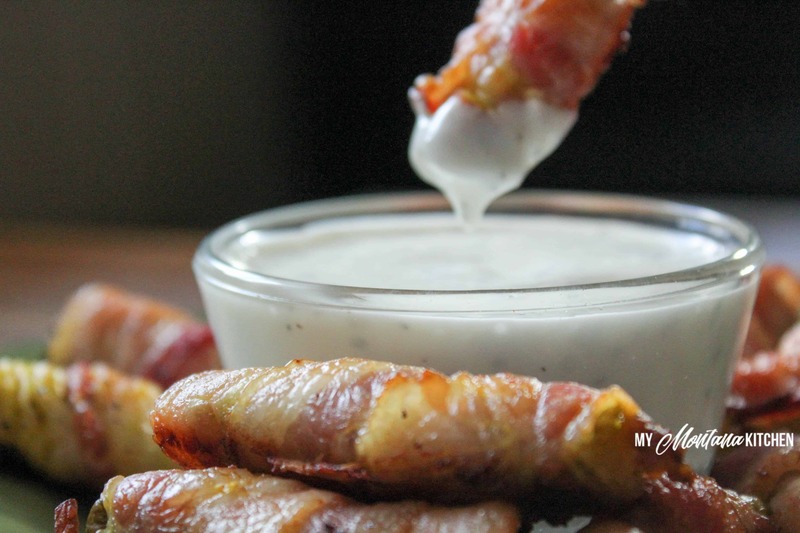 These Bacon Pickle Fries would be a great thing to take to a party. I think they taste better after they have completely cooled, which allows the bacon to crisp a little more. If you are unsure of eating warm pickles (My sister-in-law was afraid she would be desecrating her bacon with a warm pickle. Ha! ), just let them cool completely before you eat them. That is, if you can! These smell so good while they are baking! My mouth is watering just thinking about them! I like to serve them with a Ranch dressing for dipping. So, what do you need for these Bacon Pickle Fries? Wrap each pickle quarter with half a piece of bacon. Bake for 20-25 minutes, or until bacon begins to get crispy. I love, love, love this recipe! Delicious!!! 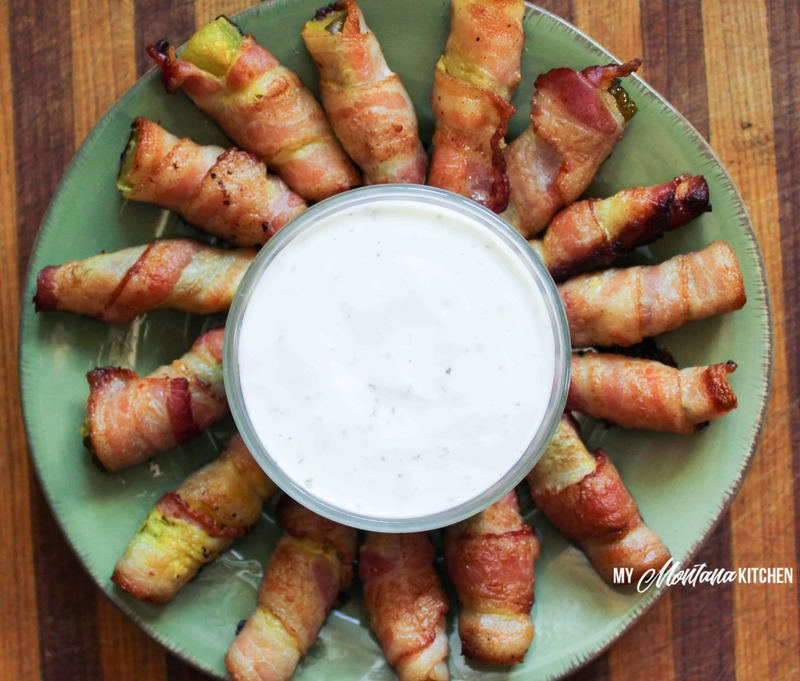 my daughter loves fried pickles I usually wrapped jalapenos and bacon with cream cheese, I was thinking this might be good as well but I have a question… what type of pickles do you use for this recipe? Are the Vlasic crispier pickle better or does it really not matter? And do you buy whole pickles and then slice them into the Spears? It doesn’t really matter what brand of pickle, I just make sure I buy dill, not sweet. I buy the spears and slice them, but you could slice your own as well. This are very good! Adding a brushing of a sweet smoky barbecue sauce on them and eating them without ranch is good too! Very delish! These look awesome. I would totally eat on these little guys! Making these today! My 14 year old son asked me to make these! Can’t wait! Yum! 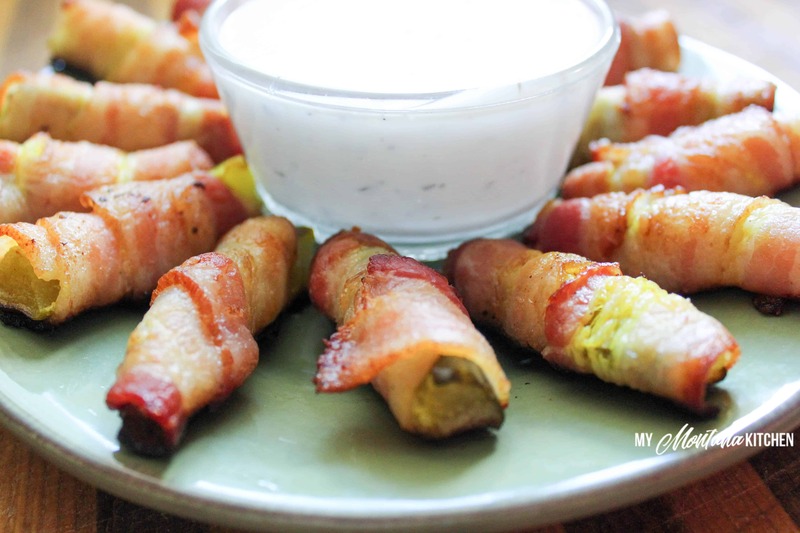 I’m going to make these for my Bacon loving son using Spicy Pickles – for our Christmas! He will be so happy and impressed! Also going to choose one of the Hot Cocoa’s that you put in the Hot Cocoa grouping (I think that was you?) – taste testing starts today! Yay! 🙂 Thanks for making Christmas Yummy! These are my new go-to snack! I keep the ranch suggested on hand. Thank you! I made mine a little different, but it was delicious! I used Bubbies’ Pickles, and the whole ones are small enough to wrap. On some of them, I used two pieces of bacon though. Very tasty! Thanks for sharing! Such a fun recipe and perfect for game day! Love how easy these come together too! YUM! omg I fear I would eat WAY too many of these- they look so freaking delicious!! Seriously 2 of my favorite things in one! Pinned! My husband would love this! Perfect for Game Day or as a shared appetizer for a girls’ night in! These were amazing! I am so glad I tried these. My absolutely favorite snack/appetizer now. Thank you so much for this recipe! Yes, after cooking, I would refrigerate them.